Aaron Cook Dot Com ™ - Life, Blogging, Money. 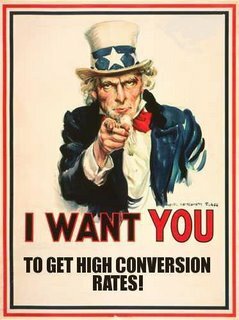 : Get Conversions, Not Just Clicks! A lot of people have asked the question, "How can I get a high conversion rate from my Pay-Per-Click advertisements?" A conversion rate is simply the percentage of website visitors who take a "desired action." And a "desired action" can take on many forms, all of which will be different from website to website. Sales of products, membership registrations, software downloads, newsletter subscriptions, information requests and pretty much any activity beyond simple page browsing. 1. The interest level of the visitor is maximized by matching the right visitor, with the right offer, at the right time. 2. The attractiveness of an offer includes the proposed value, in addition to how well it's presented to the visitor. Marketing Secret: It's definitely worth pointing out that small, impulse items will generally have a higher conversion rate than large shopping items will! Write your ads for sales conversions, NOT for clicks! Well, of course this can get you tons of clicks, but will it get you conversions??? Remember, you're paying PER CLICK with your advertising, so you definitely want to make certain those clicks count! Use these to write an ad that will convert at a higher percentage! An example of a bad ad would be: "Get Free Ringtones - Just Click Here For Free Ringtones! An example of a good ad would be: "Get 15 Free Ringtones – Just enter your phone number and receive your Free Ringtones!" Another example of a good ad would be: "Free Ringtones – Get 15 Free Ringtones with each new subscription!" Don't ever attempt to trick or fool your customers! If you do, your ads will surely get the costly clicks, but they will not convert into sales. And your potential customers will leave your site the second they think you're trying to pull a fast one on them!